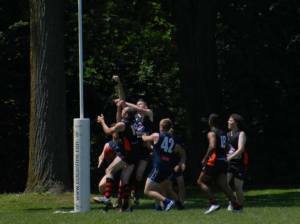 Div 2 Dingos continue their winning streak as they demolished the fourth-placed Central Blues by a whopping 90 points during their round 11 clash at Humber South last Saturday afternoon. It was their biggest win for the season and extended their unbeaten run to six in a row including one forfeit result. The red and black were dominant throughout the game with slick, skilful football. And never faulted. Wave after wave of attack produced goal after goal.The first quarter produced six unanswered goals. The second quarter produced another five unanswered goals. By halftime the score read: 11.7 (73) to 1.0 (6). The match by then was well and truly over. Big Jim Sheehan in the ruck and skipper Alvin Ranchhod supplied the forwards with plenty of opportunities to score; Ben Kavenagh and Paul Tinkler did not let them down. They both enjoyed a feeding frenzy in the goal square as they shared most of the goals. Kavenagh booted eight, while Tinkler kicked seven goals. JV Arnaldo mopped up the scraps with two goals and Tim McKay held his own inside the forward 50 arc. Big Jim Sheehan took complete control in the ruck, slapping the ball into dingo possession in every contest. Alvin Ranchhod and Mick Densworth were tough at the ball all day resulted in continuous delivery into the forward line. The Blues were a little more competitive in the second half, adding 2.3 to their score, but the Dingos made sure they were going to win big, booting 6.2 in the final two quarters. Ryan Cross took up full back duties this week and marshaled an effective back line comprised of Luke Coonan, Jake Steinberg and Gary Conlon who relentlessly shot down the Blues attack. Robert Fitzhugh and Pat O’Shea showed remarkable improvement in their game on the flanks and ran all day. 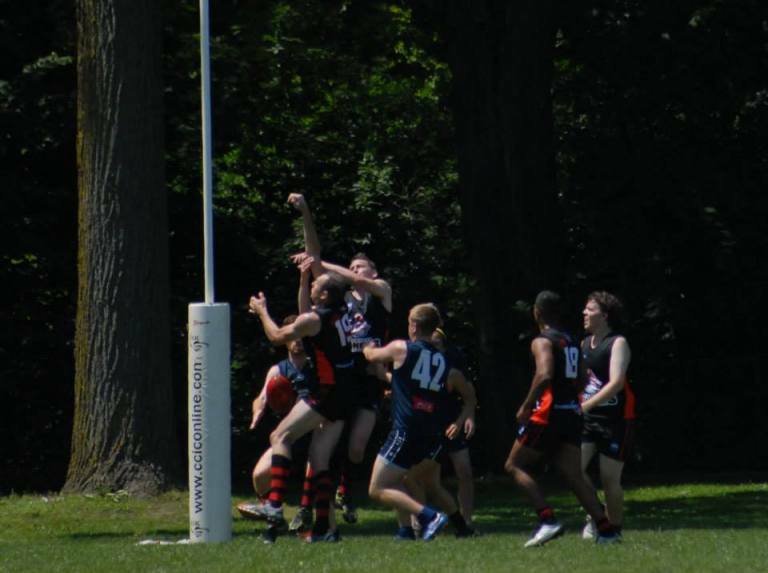 With two more games remaining – a regular season match and a “make-up” game – can the Dingos remain undefeated in 2013?